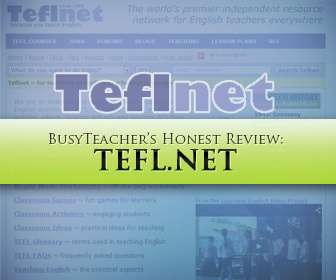 TEFL.net is described on their website as a free independent resource site for teachers of English worldwide. TEFL resources include worksheets, articles, advice, forums, job ads, and lessons. The “about” section on the website explains that TEFL.net is is part of the EnglishClub community. However, it is intended to be used by teachers only, which differs from EnglishClub, a website designed for use by both instructors and students. Founded by Josef Essberger of Cambridge in 1989, the website has been a staple for EFL and ESL teachers many years, and it continues to grow. The website has great general information about the field of teaching English as a foreign language, and is an excellent place for new teachers to get started. There are listings for certification programs, both online and in particular geographic areas; resources for job hunting: employers can post job ads, and teachers can post resumes; well-frequented forums with a range of topics; and various features to help teachers design curriculum and materials. The site also has a number or downloads and links to direct teachers to other resources. TEFL Inspire is a free monthly newsletter that users of TEFL.net can sign up for on the website. Subscribers receive news, teaching tips, reviews, and articles. There’s also a weekly email list that anyone can join to receive teaching tips. All in all, it’s an incredibly vast site, and Josef Essberger does a great job of incorporating feedback and requests when developing site content. I find that this website is best used as a place for teacher development rather than lesson planning (although there are many resources available on the site to help you with that.) There are some excellent resources available for those thinking about entering the profession. Visitors to the site can find information about TEFL and CELTA certification and graduate MA TESOL programs, get answers to frequently asked questions, and find information about the types of jobs available to EFL and ESL teachers. Deciding which certification to get and how to proceed can be daunting, and TEFL.net does a great job of answering some of the most common questions that prospective or new teachers often have. This website has extensive resources for teachers. It’s like an online TEFL course that can be accessed at any time. There is no topic left untouched. Without a doubt, you can find just about anything you are looking for on this website. For example, there is information about teacher body language in the classroom. There’s also information about appropriate clothing and appearance expectations. There isn’t much about particular countries, but the general discussions about these important considerations will get new teachers to think about crucial, yet subtle things that are often overlooked. There are many portions of the website devoted to classroom materials; games are neatly categorized according to skill level, and most can be modified to suit particular group of students. One could spend days accessing the wealth of information available on this site. It is truly a goldmine of information. In fact, if I had to choose one TEFL website only, I’d recommend this one as the most all-around useful. The website includes an extensive forum for teachers with topics ranging from job placement to classroom management. Some of the categories are designed for teachers working in particular regions (namely Europe and Asia). There are forums for grammar, CALL, administrators, games, exams, teaching training and business English. For most teachers, just browsing the existing forums will yield answers to many questions without even needing to post a new question. In addition to the great forums, there is a job bank to help teachers find placements domestically and overseas, and there is even a portion of the website devoted to job “scams”, an unfortunate reality in the world of teaching EFL. Wherever one is in their teaching career, there is something on TEFL to access the knowledge needed to advance professionally in the field. Tefl.net is an excellent place for those interested in teaching English as a foreign language to get preliminary information about starting out in the field. Much of the content is similar to what is provided in a TEFL training course, and for those who are in the early stages of teaching, it can serve as an excellent guide. It’s also an excellent resource for new and experienced teachers currently abroad, particularly in terms of maintaining contact with others. The frequently asked questions and forums are wonderful resources for those who want information about a variety of topics. I think this is an especially helpful website for those with limited resources and networks in their placements abroad. It’s a wonderful way to connect with other professionals. The worksheet generator portion of the website is an excellent resource for teachers. Teachers can make worksheets and answer sheets by entering information into an easy-to-use form. It’s quick and painless, and with little effort, teachers can have a custom worksheet ready in no time! Furthermore, the worksheet templates are divided into categories to guide teachers to the best worksheet for the particular content or skill they are designing materials for. This is great way for teachers to develop personalized materials that are contextually-appropriate for their classes, without having to start completely from scratch. I love this portion of the website, which includes terms that those in the EFL or ESL profession will undoubtedly come across either in training or in the field. For new teachers, especially, this can be a great place to clarify what something means without having to look silly in front of their bosses or colleagues! In other words, this helpful tool will save them from the embarrassing task of having to ask someone to remind you what a cloze exercise is, or what L1 refers to. The list also contains definitions of the many acronyms in the field, which is difficult for anyone to keep straight. While on one hand the comprehensive nature of this website is one of its best attributes, the endless resources can actually be a bit difficult to sort through. This is a good problem to have; however, it definitely might take a little time to familiarize oneself with all that is available on this site. For teachers who are in a hurry, it may be a bit daunting to find what they are looking for. Ideally, instructors will take the time to familiarize themselves with all the website has to offer ahead of time, so that frantic last-minute preparation for classes (we’ve all been there; it happens occasionally, right?) can go more smoothly. There are so many resources, that it’s possible to miss the best section on the site for your one’s needs, but with a little investment of time at the outset, this website can serve as a tremendous resource for any and all TEFL needs. The website is primarily based on British English. This isn’t a huge issue or problem, but teachers using American English in the classroom need to be careful, especially when printing ready-made worksheets or activities in order to ensure that the vocabulary and spelling is appropriate for their classrooms. It can be very helpful to have access to print-and-go worksheets, but most teachers like to have the option of adapting materials, at least slightly, to best fit the content they are teaching or their particular objectives for a lesson. TEFL.net has .pdf documents in place for most of their quizzes and activities, so the teacher can’t edit worksheets to suit their needs. That said, these ready-made resources can serve as a wonderful jumping off point, and if nothing else, can help with brainstorming ideas for materials development. Unfortunately, a reality of most free websites these days is that there are many ads floating across the screen while you’re visiting the site. This is also true of TEFl.net, and it can definitely be a bit distracting. As I mentioned earlier, the website contains a large amount of content, as it is, and the advertisements only serve to add to any difficulties one might have sifting through the enormous amount of resources available. For those who get overwhelmed by busy visuals on their computer screens when visiting websites, it might take some time to get used to TEFL.net. Overall, I would highly recommend TEFL.net for those who are thinking of entering the profession of teaching English as a Foreign Language and for new, less-experienced teachers abroad who are just getting their feet wet. It’s a great starting point for anyone who is curious about teaching internationally. If someone has the time to spend navigating the site, there is a plethora of helpful information available to help them get started on their EFL journey! I’d also highly recommend it as a place to network and form relationships with other professionals. The warnings about “scams” are also a wonderful addition to the site; many a teacher has gotten a job lead that has ended up as a dead end, or worse, as a dangerous situation in a foreign country. The warnings about fraudulent job postings are a wonderful resource to help professionals avoid just that. The classroom resources available are useful, especially for novice teachers, and when in a pinch, the worksheet generator is wonderful tool for those who have the time and the inclination to do their own material development. Whether someone is mildly curious about teaching abroad, or ready to pack a suitcase and go, TEFL.net a fabulous place to get started! Have you ever used TEFL.NET? Was it helpful? Share your thoughts in the comments below, we’d love to hear from you!